In these circumstances, the entire monetary policy framework is up for grabs. Shibboleths will have to be dispensed with. At zero rates, central banks may have to work increasingly closely with finance ministries, prioritising the need for co-ordinated action over the desire for independence. Inflation targeting may have to be ditched, perhaps replaced by nominal gross domestic product targeting: a slowdown in real growth would then be countered by a commitment to higher inflation, boosting nominal GDP and limiting the risk of ever more indigestible debt. Yet nominal GDP targeting will work only if central banks can credibly demonstrate not just their desire for higher inflation but also their ability to deliver it. To date, they have not been particularly successful. And if productivity growth is permanently lower, expectations of a life of ever-rising prosperity will have to be abandoned. If the economics are already difficult, the politics will be considerably harder. Characterizing NGDP Targeting as a framework in which a slowdown in real growth has to be countered by a commitment to higher inflation is a confused idea. A real growth slowdown may be the result of a negative demand shock or of a negative supply shock. In the former situation, inflation will also fall. In the latter it will rise. If the central bank is focused on delivering Nominal Stability (which NGDP Targeting, level targeting does provide), drops in real growth resulting from monetary shocks will be avoided, while supply shocks will be “ignored”. Actually, the fact that the Bernanke Fed was so focused on the inflation from the rise in oil/commodity prices was its downfall. In that sense, you could say the Fed is flexible in allowing the (temporary) rise in inflation following a supply shock, but to say it has to be “committed” to it is pure nonsense. 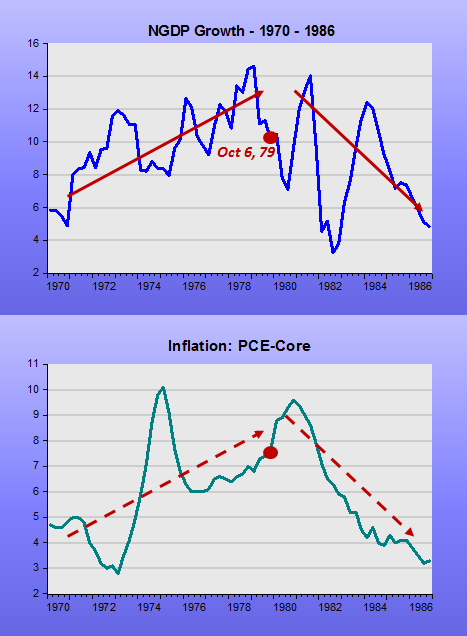 The charts provide a visual history of the economy´s nominal and real growth and inflation. The first thing to notice is that an inflation process (1970s) is characterized by increases in both headline and core measures. This was true in the 1970s and it was made possible by the up trending NGDP growth. Instances of oil shocks (red dots) are associated with increases in inflation (both Headline & Core) and recessions in the 1970s, but in the 2003-05 and 2007-08 oil shocks, only headline inflation shows a modest increase. The reason for the very different outcomes can be found in the contrasting behavior of monetary policy: very expansionary in the 1970s (up trending NGDP growth) and “stable” in the 2000s. Volcker´s first attempt at reducing inflation in early 1980 was unsuccessful. His second attempt in late 1981, characterized by a strong monetary contraction (steep drop in NGDP growth) was a success. The important thing to note is the healthy bounce back in real output growth after the deep 1981/82 recession while inflation kept falling. As soon as he took the Fed´s helm in early 2006, Bernanke showed concern with inflation. With the second leg of the oil price rise in 2007, the concern became an obsession. 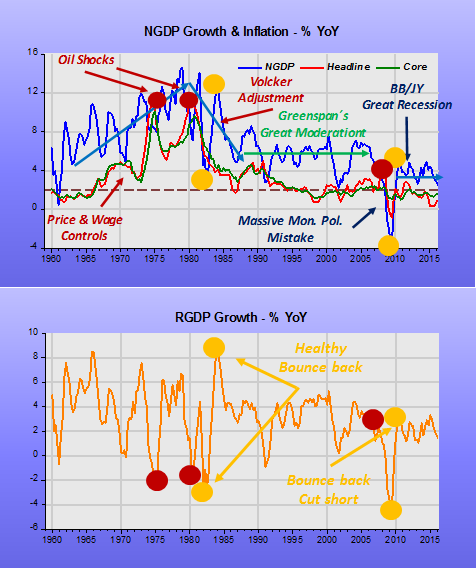 Monetary policy (NGDP growth) began to tighten and in mid-2008 the brakes were pressed hard. The aftermath, which shows a complete absence of real output bounce back, has kept the economy depressed (or in a state of “Great Stagnation”). The “Great Moderation” is strong evidence of the benefit of having nominal stability, a situation where the central bank is successful in keeping NGDP growth on a stable (stationary) path. That is the result of the CB offsetting changes in velocity by opposite changes in the money supply. Note that, by not explicitly targeting NGDP, in 2001-2003, the Fed inadvertently tightened monetary policy. 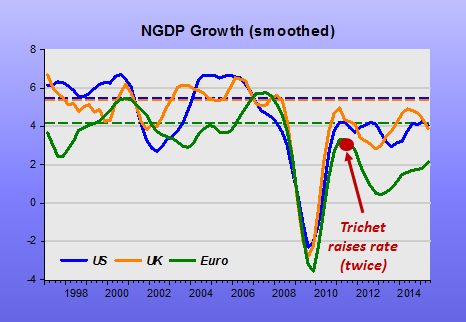 After mid-2003 this error was corrected, with NGDP growth moving back to the stationary path. The Bernanke Fed quickly changed the (effective) monetary policy framework to one first effectively and then explicitly based on inflation targeting. 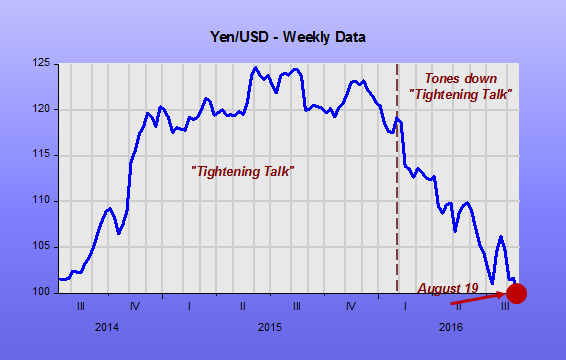 Lately, with inflation persistently below target and “zero” policy rate, the monetary policy framework has become one geared to policy (rate) “normalization”. The manifest failure of this framework has lately been a topic of discussion at the Fed, with John Williams letter being one example. However, if you pay attention to NGDP growth, you immediately conclude that both the lackluster recovery and low inflation are the natural consequence of excessively tight monetary policy, or too low NGDP growth. This could be “cured” by the adoption of an explicit NGDP Level Target monetary policy framework. PS The resistance in abandoning the IT framework is strong. This piece by Greg Ip “The Case for Raising the Fed’s Inflation Target” attests. Call me a conspiracy theorist but when three unrelated beasts of the global financial establishment all start talking about the same, previously unfashionable, thing it’s a bit of a coincidence. Maybe Larry’s put it in the agenda of next week’s G20? If it’s not, it should be. The MPC have revised down their forecast for real GDP growth and CPI inflation in the short term, implying weaker nominal growth. This, combined with threats from the international environment, mean we face the risk of a weaker outlook for nominal GDP. If realised this could present challenges for tax receipts in the future, and reinforces the importance of delivering our plan to achieve a surplus on the public finances by the end of the Parliament. 3. Cut rates back to near-zero and strong guidance: if the equity market drops into a full bear market (or there is some other equivalent financial tightening) or if growth seems to be slowing to a sustained 1%, the Fed would likely cut and remain on hold until the financial/economic weakness reverses. They could introduce a nominal income growth target or price level target to signal an accommodative path for rates well into the future. But monetary-policy makers need to acknowledge much more explicitly that neutral real rates have fallen substantially and that the task now is to adjust policy accordingly. This could include setting targets for nominal GDP growth rather than inflation, investing in a wider range of risk assets, making plans to allow base rates to turn negative, and underscoring the importance of avoiding a new recession. Among serious economists, the words “print more money” are not used, and of course the thought is sacrilege for many. Evidently, some prefer a decade or so of 20+% unemployment (see Spain, Greece), or the perennial loss of about 10% of GDP (the United States) to the idea of printing more money. Summers correctly points out that interest rates are already low, especially in Europe and Japan. Though Europe is experimenting with negative rates, there doesn’t seem to be much oomph there. In other words, print money to finance national budgets, which China’s central bank, the People’s Bank of China, has been doing with infrastructure projects for decades. China has grown at about 10% annually compounded for decades, and now has inflation of 1.5%. They obtained these results even with a dubious system for allocating capital. Anyone who travels other First World cities, and then views U.S. public spaces and airports, surely suspects more infrastructure spending is indeed warranted. Summers’ suggestions strike me as very worthy. But, as I am suspicious of federal programs (as enacted by the U.S. Congress), my pet idea is for the U.S. Federal Reserve to buy Treasuries and place them into the Social Security and Medicare trust funds, and then deliver a hefty cut on payroll taxes to workers and employees. FICA taxes are now more than 15% of a typical worker’s paycheck. Cut FICA taxes in half for a few years, and we might see some real demand in the U.S. The Fed should buy about $500 billion in Treasuries a year, under this plan. Print more money, in other words. “The argument is that the duration risk in long term Treasuries is negatively correlated with the risk in fixed capital. I think this is clearly true. The risk of long term Treasuries is that future short term rates will be high. This can be because of high inflation or because the FED considers high real rates required to cool off an overheated economy. Both of these are correlated with high returns on fixed capital (someone somewhere keeps arguing that what the economy needs is higher inflation). It just so happens that there is Vector Auto-Regression (VAR) evidence on the relationship between QE and business investment. and statistically significant decreases in the value of the US dollar. In this series of posts we are going to show that in the Age of ZIRP, inflation expectations, stock prices and the US dollar all have an effect on investment in equipment, a component of business investment. Private nonresidential investment in equipment is only available at a quarterly frequency. So since this analysis requires data at a monthly frequency, it is necessary to find a proxy variable for investment in equipment. In applied macroeconomics, proxy variables typically satisfy two main requirements. 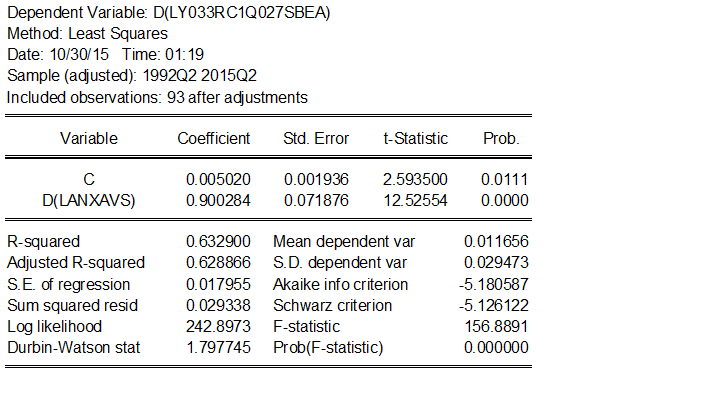 First, the proxy variable should measure the equivalent characteristic of a reasonable subset of the variable being proxied. Secondly, the contemporaneous growth rates of the proxy variable and the variable being proxied should be correlated (i.e. have a relatively high Pearson’s r value). Value of Manufacturers’ Shipments for Capital Goods: Nondefense Capital Goods Excluding Aircraft Industries (ANXAVS) overlaps in content considerably with US private nonresidential investment in equipment, and is available at a monthly frequency back to January 1992. 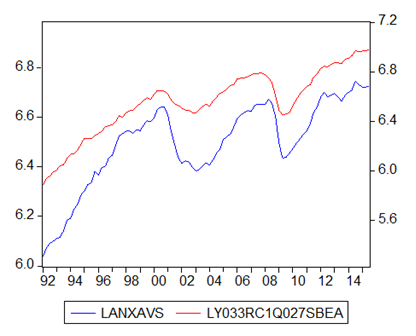 Here is a graph of the natural log of ANXAVS and the natural log of Gross Private Domestic Investment: Fixed Investment: Nonresidential: Equipment (Y033RC1Q027SBEA) since 1992Q1. ANXAVS overlaps in content with private nonresidential investment in equipment, and it ranges from 77.4% to 116.2% of Y033RC1Q027SBEA from 1992Q1 through 2015Q3. So it would appear that the first proxy variable requirement is well satisfied. Now we must check to see if the two variables are correlated. Here are the results of regressing the logged difference (i.e. 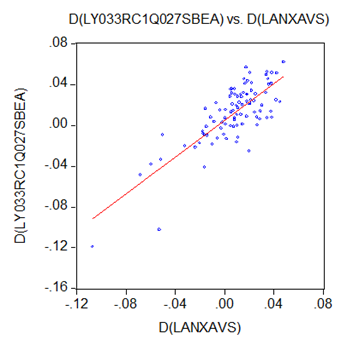 the growth rate) of Y033RC1Q027SBEA on the logged difference of ANXAVS and the corresponding scatterplot with the Ordinary Least Squares (OLS) regression line. The R-squared value is approximately 0.633. Since the growth rates are positively correlated, the Pearson’s r value is +0.796, which is above average for a macroeconomic proxy variable. So it would appear that the second proxy variable requirement is well satisfied. Thus we conclude that ANXAVS is a suitable monthly frequency proxy for private nonresidential investment in equipment. In Part 2 we’ll check to see if inflation expectations, stock prices or the value of the US dollar are “correlated” with private nonresidential investment in equipment in the age of ZIRP. Permanent Effects of Fiscal Consolidations or Permanent Effects of Monetary Crashes? The global financial crisis has permanently lowered the path of GDP in all advanced economies. At the same time, and in response to rising government debt levels, many of these countries have been engaging in fiscal consolidations that have had a negative impact on growth rates. We empirically explore the connections between these two facts by extending to longer horizons the methodology of Blanchard and Leigh (2013) regarding fiscal policy multipliers. Using data seven years after the beginning of the crisis as well as estimates on potential output our analysis suggests that attempts to reduce debt via fiscal consolidations have very likely resulted in a higher debt to GDP ratio through their negative impact on output. Our results provide support for the possibility of self-defeating fiscal consolidations in depressed economies as developed by DeLong and Summers (2012). Interestingly, when he was number two to Rubin (and later top Treasury honcho) during the Clinton Presidency (1993 – 2000), Larry Summers peddled “stimulative austerity”, the idea that to cut deficits would lower interest rates by enough to produce stronger growth. There was certainly a lot of consolidation, although real interest rates rose instead of fall. That excessive attention to the level of interest rates is, according to market monetarism precepts, highly misleading. So Summers had his “wish come true”, but not from the reasons he advanced. The global financial crisis has permanently lowered the path of GDP in all advanced economies. In none of these countries GDP is expected to return to its pre-crisis levels. At the same time, many of these countries have been engaging in fiscal consolidations in response to rising government debt levels that had a negative impact on growth rates. In this paper we use the methodology of Blanchard and Leigh (2013) to show that fiscal consolidations had long-term effects on GDP, at horizon much longer than the traditional analysis of fiscal policy multipliers. As the charts below show, it is more likely that what has “permanently” lowered the path of RGDP is the “permanent” monetary crash that took place in 2008 (both in the US and Europe). During the Great Inflation NGDP was growing on a rising trend, with RGDP remaining much of the time above trend (“potential”). 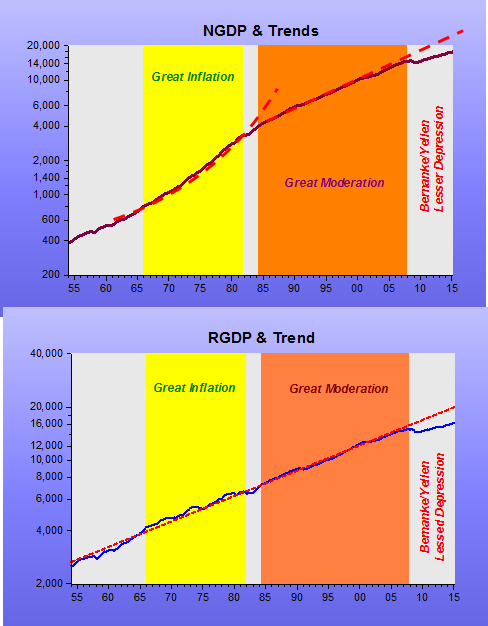 During the Great Moderation, with NGDP evolving very close to the trend path, RGDP was also very close to trend. The monetary crash (that was never offset) has doomed RGDP to a permantly lower level! Monetary Policymakers don´t lack the tools, they lack the will! First off: the level of interest rates do not define the stance of monetary policy. This and reasoning from a price (or quantity) change are the most common conceptual errors made by economists of all stripes, including Prizewinners! Even those like Bernanke, who know best, having stated very clearly in 2003 that interest rates are not a good indicator of the monetary policy stance, saying we should look at NGDP (or inflation, but let us leave that one aside, not only because it is far below “target” everywhere that counts). The chart indicates that for a significant fraction of “industrialized economies”, monetary policy has been “tight”, certainly not “very loose”! Prior to the crisis, nominal spending growth was the same in the US and UK (around 5.4%) and much lower in the EZ (4.2%). Note that after the initial pullback from the deep recession, the ECB under Trichet pulled the brakes hard in early 2011, throwing the EZ economy back into hell. Meanwhile, in tandem, the US and UK said “that´s enough nominal spending growth” (4%). No wander inflation languishes (as does real growth and employment). Why did all those central banks, the ECB more radically, put a premature stop to the recovery? The obvious answer is fear of breaching their inflation target, even for a “moment”! In that they sorely lacked what came to be called a “Volcker moment” (or, to paraphrase FDR, a “Volckerian Resolve”). Ironically, or maybe not, the country that has been in hell for longer, Japan, is now trying to get back to savoring some “worldly goods”. Let´s hope the others “get smart” more quickly! 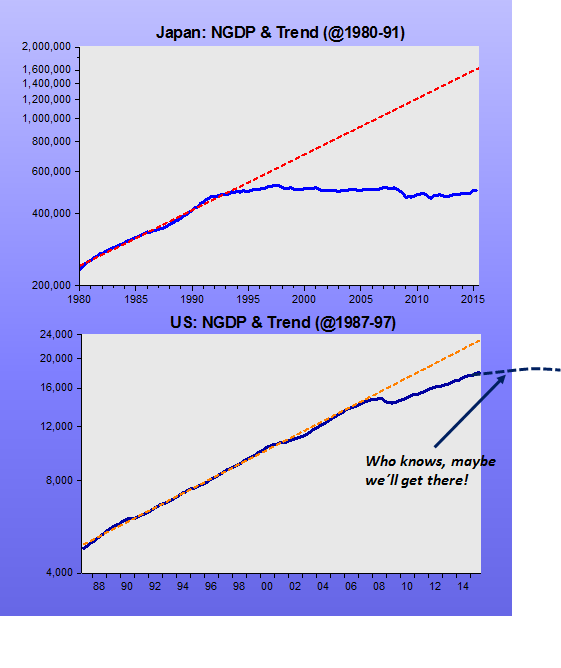 Now the Fed (and others) have to adjust NGDP growth up. But please, not through more government (which Japan´s experience also shows doesn´t have lasting effects). Recently there has been a hubbub in Market Monetarist circles that prominent Democratic economist Larry Summers, generally a Keynesian type, tipped his hat to nominal GDP level targeting, or NGDPLT. Well, at least in preference to inflation targeting or IT. That Summers endorsement of NGDPLT was hesitant and oblique may not be surprising. He is, after all, a Keynesian, and believes in federal deficit-spending. But Summers may also have entirely human and sensible reason for his backhanded support of NDGPLT—that is, a central bank can just as well suffocate an economy under NGDPLT as under IT. Indeed, the U.S. Federal Reserve has kept the U.S. economy growing at a fairly steady nominal rate since 2008. The problem is, the economy is blue in the face from monetary asphyxiation. Forgotten today is the Milton Friedman of October 1992, when CPI inflation was 3.2%, and real GDP was expanding at about 4.0%. That 1992 Friedman op-ed speaks worlds about the inflation-obsessed state of modern economists. Yet some Market Monetarists recommend straitjacket nominal growth rates, succumbing to the present-day peevish fixation that inflation—even moderate inflation—cannot be endured. We can hope someone will further flesh-out Summers’ sentiments regarding NGDPLT. But whatever Summers’ take, I hope Market Monetarists do not mimic the inflation-nutters. It doesn’t really matter if inflation is 1% or 4%. What matters is robust real growth. The lack of imagination is pervasive! The great financial crash of 2008 was expected to lead to a fundamental re-thinking of macro-economics, perhaps leading to a profound shift in the mainstream approach to fiscal, monetary and international policy. That is what happened after the 1929 crash and the Great Depression, though it was not until 1936 that the outline of the new orthodoxy appeared in the shape of Keynes’ General Theory. It was another decade or more before a simplified version of Keynes was routinely taught in American university economics classes. The wheels of intellectual change, though profound in retrospect, can grind fairly slowly. What about macro-economic policy? Here major changes have already been implemented, notably in banking regulation, macro-prudential policy and most importantly the use of the central bank balance sheet as an independent instrument of monetary policy. In these areas, policy-makers have acted well in advance of macro-economic researchers, who have been struggling to catch up. The IMF has tracked this process well, and it has just held its third post-2008 conference on Rethinking Macro Policy under the leadership of chief economist Olivier Blanchard. Olivier has summarised the conference (here and here) but so far it has it not been much discussed by macro investors. I have therefore taken the liberty of organising Olivier’s summary and the conference material into the three tables below. Although highly simplified, the tables represent a snapshot of the current “state of the art” in macro policy, at least as seen by today’s mainstream luminaries of the subject. In conclusion, what should we expect from macro-policy makers in future, assuming the economic back-drop remains relatively benign? Probably, more of the same: broadly stable central bank balance sheets, very slow declines in public debt ratios and a gradual return to using interest rates as the main weapon of monetary policy. A more rapid return to pre-2008 norms for fiscal and central bank balance sheets is somewhat unlikely. To call the economic back-drop benign is a stretch; but while that remains the conventional thinking, Summer´s “Great Stagnation” thesis will continue to be ‘celebrated’! Why can´t they see that the “GS” is the exact opposite of the “Great Inflation”? Interestingly, while the “GI” was going on, the prevalent thought was also that monetary policy couldn´t do much to abate it!